If you weren’t already aware, itch.io has a great system for managing collections of games. You can make public or private collections of the games you like (or dislike). Public collections can be embedded on your profile or just shared by passing around the link. Since collections have been available as a feature on itch.io, over 22,000 games have been added to collections. 75% of all collections on itch.io are public. Collections on average have 6 games, and the biggest collection has 577 games! 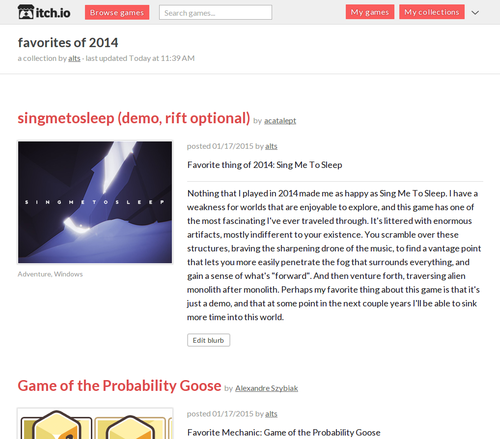 itch.io’s homepage and browse pages are great ways to find games, but with 9700 games, itch.io can only curate so much. For that reason, I want collections to grow into an excellent way to find games recommended by people with similar interests. The first update is a new way to present your collections. In the past all collections were shown as a grid. You may have noticed that you could write about each item in the collection but it only showed up as tiny text below the game in the grid. You can now enable a List mode, which gives your blurbs plenty of space and much better readability. Check out this collection favorites of 2014 by alts. 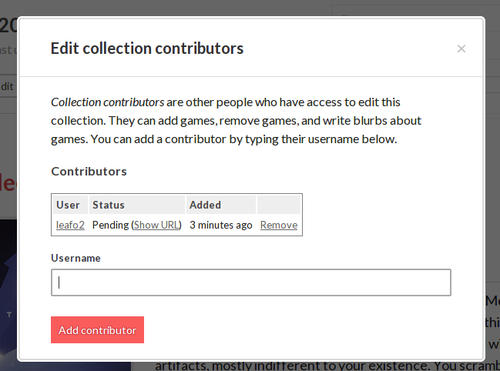 Use collections to create blogs about your favorites to help spread awareness of the developers whose work you enjoy. The best curating efforts often aren’t solo operations. Starting today you can now invite other people to work on your collection. They can add and remove games and write or edit blurbs just like the owner could. Find the edit Edit contributors button on the collection’s page and invite some collaborators. When they write blurb they’ll be credited as the author on the collection page.